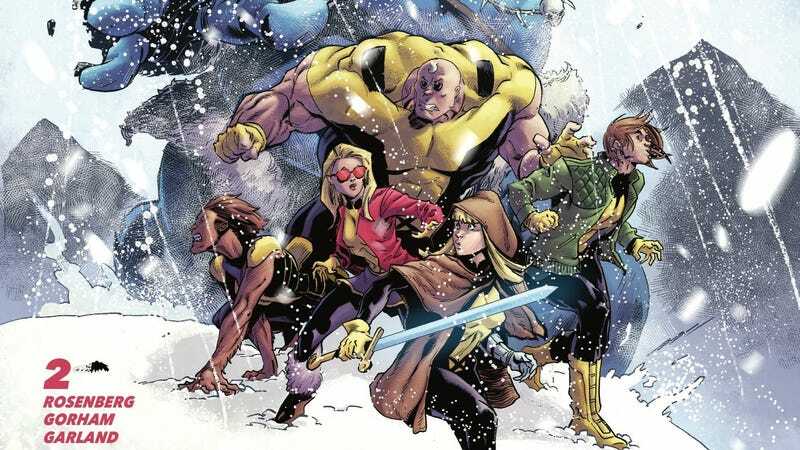 Fox’s The New Mutants movie may have just gotten delayed a second time, but that’s not stopping the New Mutants comic-book revival, which takes these X-Men-adjacent characters in a new direction courtesy of writer Matthew Rosenberg, artist Adam Gorham, and colorist Michael Garland. The New Mutants: Dead Souls miniseries assembles a group of mutants—some previously associated with the New Mutants, some not—to investigate strange phenomena around the world, and it’s a compelling take that significantly benefits from a single-issue story structure. Each chapter gives the team a new mission, and after stopping an undead uprising in Alabama last month, the team is heading to Russia’s October Revolution Island to take on a rampaging Frost Giant. This structure forces Rosenberg to pack each issue with plot, and he’s doing great work advancing larger storylines and exploring character dynamics while telling a complete tale in each issue. This exclusive preview of next week’s New Mutants: Dead Souls #2 spotlights this creative team’s ability to jump from high-stakes horror to casual character interactions, and after a tense opening scene on October Revolution Island, the action jumps to three of the New Mutants having brunch with Shatterstar, Rictor’s boyfriend. Gorham’s compositions and Garland’s colors reinforce the tonal contrast between these two scenes, and there’s an intensity in the first two pages that disappears for the carefree brunch. That calmness is important for making this team feel like a group of friends, but their moment of relaxation is cut short when their leader shows up to whisk them away for their next mission. There’s no time for brunch when the world is in danger, and hopefully those mimosas won’t hinder the heroes’ performance in the field.